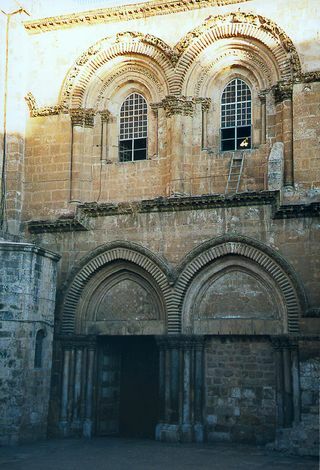 Originally built in the early 4th century by Constantine, the Church of the Holy Sepulcher long ago lost its original entrance and nave. 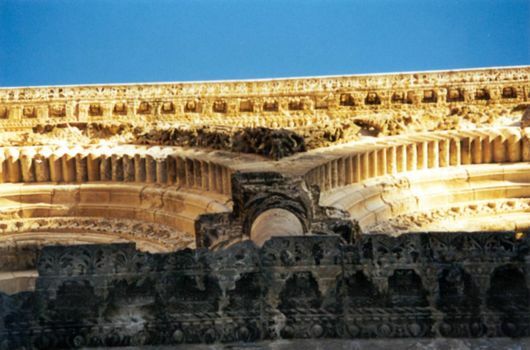 So modified over the centuries that all design coherence has been lost, the building still attracts huge crowds because it probably does mark the site of the crucifixion. Photographing it without crowds therefore requires a dawn visit; fortunately, the doors open at 4 a.m. in summer--5 in winter. The only functioning entrance is on the south side of the church--and half of it has been walled shut since the 12th century. Change comes very slowly here, especially since the Ottoman Sultan Abd al-Majid I declared in 1852 that no change could be made in any part of the church that was shared by the Greek Orthodox, Latin (the local name for Catholic), and Armenian communities without their unanimous consent. The common ground includes this courtyard and the entrance, where, for lack of unanimity, nothing has been changed since 1852. That includes the famous ladder under the right-hand window. The original long ago rotted but was replaced. 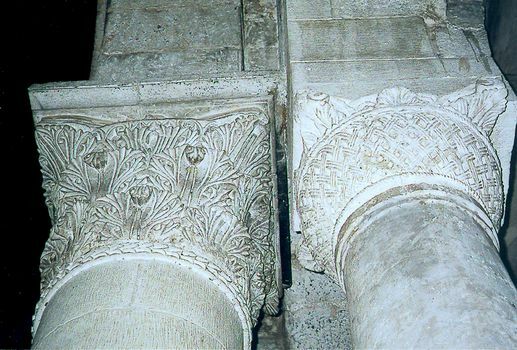 Looking straight up from the modern entrance to Crusader embellishments. A former entrance, similar in style to the present one but on the west side of the church, faces the Christian Quarter Road. 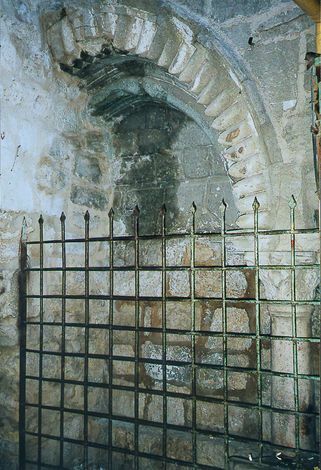 It once led to the chapel of Mary Magdalene, a wing added to the north side of the church. Constantine's atrium and basilica were lost in the 11th century, and the remaining church is build around an immense rotunda, itself heavily rebuilt after the 11th century. Here, two columns that rim the rotunda were formed by cutting an immense Roman column in two. 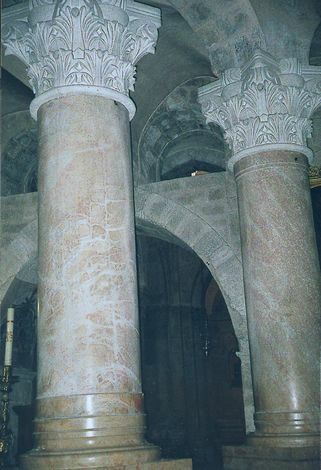 The column on the right is older and supports the Byzantine courtyard adjoining the rotunda; the column on the left supports the 12th century chapel of St. Mary Magdalene. 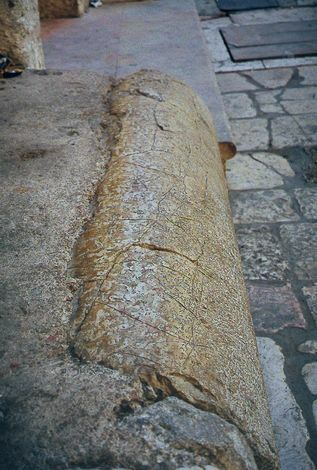 Relics everywhere: a Roman column serves as a bench in the courtyard outside the main entrance of the church.